This election has been one of the most controversial topics across the country for months, but how do students from other countries feel about the crazed battle to the finish line between presidential candidates Hillary Clinton and Donald Trump? 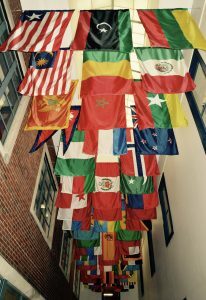 Multiple international students at the University of Rhode Island have not only kept up with the election, but even formed their own opinions about who should lead our nation. Kathleen Magalhães, a URI sophomore who is double majoring in chemical engineering and German, and Gabriela Ortega, a URI sophomore double majoring in chemical engineering and Spanish, are from Sao Paulo, Brazil, and have four more years at the university. Both agreed that the election has made them feel uncomfortable. Ortega explained that the election is definitely different from their home country because here, there are only two parties to choose from, but in Brazil, there are tons of different options. She also said that voting in her country is mandatory, while here it is not. Magalhães acknowledged this fact, and expressed that people should think more about who they are voting for and be sure of their decision because it’s not just going to affect your country, but others as well. She believes this is a big issue because the U.S. is such a big country, and other countries are following in our footsteps. Similarly, URI junior kinesiology major, Carlo Davids, feels that the election here is very different from his home country. Davids, who is from South Africa, said that hearing about the election is definitely entertaining, but it’s sad that people have to choose between two people who are made out to be so called “bad” candidates. If he had the opportunity to vote, he said that he would have no idea who to elect. He has heard some troubling things about both candidates and said that the media has not helped choose. Although he doesn’t support Trump and his actions, Davids said he feels slightly bad for him. He said that people are so biased against Trump since he says a lot of stupid things, and although he isn’t a fan of him, he noticed that the businessman is being cast in a more negative light than Clinton. “I think Hillary will probably win, but I think it will be closer than a lot of people think,” Davids said. He explained that he knows a lot of people who support Trump, but won’t outright say it. In South Africa, David’s age group feels it’s culturally important to vote, so he thinks it’s crazy that some people aren’t motivated to in the U.S. Neither Ortega nor Magalhães watched the debates, but both have been aware of the media articles floating around. Ortega explained how appalled she was to find an article where Trump had said that if he was elected, he would kick out all of the Brazilians because that would be less “trash to clean.” Magalhães, also bothered by the statement, said that although the man is highly influential, he does not think before he speaks. Both Ortega and Magalhães said that if they had the chance, they would both vote for Clinton, and they strongly believe that she has a solid chance of winning the election next week. Richter, Davids, Ortega and Magalhães all said that in their countries, they have the ability to vote for multiple different candidates or parties. Although the U.S. only has two major candidate options, they all agreed on the same thing: voting is vital. Election Day is next Tuesday, Nov. 8. Polls are located throughout the state, including at the Boss Ice Arena at URI. 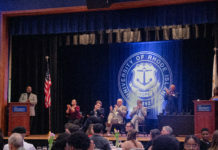 For more information, visit https://vote.sos.ri.gov/.